These thermometers use specially selected filling materials covering temperatures down to -200°C. Normal fillings are coloured red on a white glass, but alternative colours are available as shown. 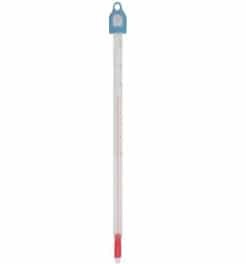 The -200°C range thermometers are filled with a colourless liquid. Thermometers are normally supplied with the non roll cap with ring.